Nov. 8, 2011, 11:30 a.m. 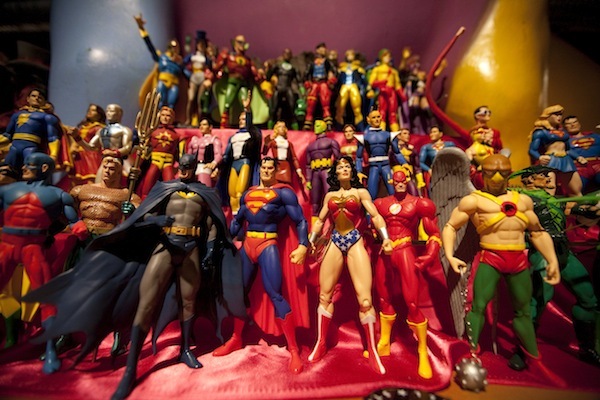 The complexities of sharing: Does “noncommercial” mean not-for-profit? The absence of ads? Or simply that you’re not selling the work someone else is giving away? By Joshua Benton @jbenton Nov. 8, 2011, 11:30 a.m.
Wired.com today announced it would, from today forward, be releasing all of its staff-produced photos under a Creative Commons license. That means lots of photos of tech-and-geek-culture luminaries — from Steve Jobs to J.J. Abrams, Tim Burton to Steve Ballmer — are now available for wider reuse; to kickstart the effort, they’ve released 50 recent photos. Creative Commons has been a force for good on the web, letting people share their work with others and making it easier to let them define the terms of that sharing. And getting Wired — and, by extension, its parent Conde Nast — on board is a good thing. But there are a couple of wrinkles here worth noting for publishers. At the cynical-publisher level, you could think of what Wired is offering more as a trade than as a pure act of sharing. It’s not: Here, have these lovely photos. It’s: Here, have these lovely photos in exchange for linking to our stories, driving us traffic and helping our story get better optimized for Google. That’s not to denigrate Wired’s motives as insufficiently pure. They run a for-profit business, not a photography charity whose mission is to improve the aesthetics of tech blogs. It’s just to note that there’s actually a business argument to be made for a move like this. Having their photos run on someone else’s website costs Wired exactly zero — and they’ll get some small but real financial benefit out of it. That’s an argument that could make sense to a lot of publishers — particularly since, as the now-near-death Righthaven knows, their photos are going to be widely used around the web anyway. Why not try to monetize them in a web-native way instead of running to the courthouse? The other restriction Wired is placing on the use of their photos is allowing only “noncommercial use.” Creative Commons builds a “noncommercial use” option right into their licenses; it’s the “NC” in the license Wired is using, CC BY-NC 2.0. But what does “noncommercial” mean? Creative Commons isn’t very helpful here. Their definition of “commercial” is “in any manner that is primarily intended for or directed toward commercial advantage or private monetary compensation.” That’s still pretty fuzzy. Selling the photo would certainly seem to count as “commercial.” But is using the photo on a web page that also has ads on it — is that commercial? How about using it on a web page that has no ads but which is on a site that has lots of them? Or how about using it on the site of a for-profit business — a site that doesn’t sell any ads but is, in effect, one big ad for the business? Interesting! As a publisher, I happen to like that definition. But that isn’t the definition of noncommercial shared by most Creative Commons users. What this chart tells us is that (a) creators and users of CC content are generally pretty close to each other in their opinions, and (b) they believe that using CC material on a site with ads counts as commercial use. For content creators, having their work appear near ads scored 84.6 on the noncommercial-to-commercial 100-point scale. For content users, that number was 82.6. In fact, both creators and users argued that the mere fact that an image was being used by “an organization” instead of “an individual” rendered it more commercial than noncommercial. 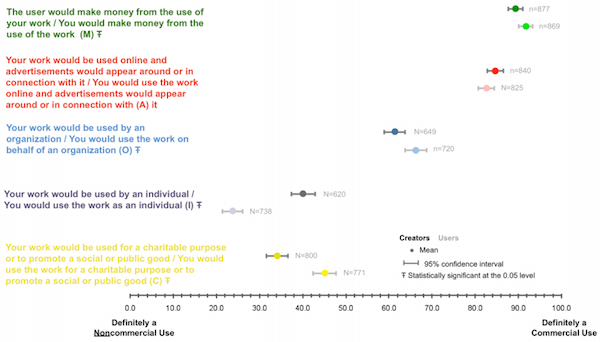 Go check out that PDF if you want to see much more detail, but the takeaway is that, while Creative Commons has left “noncommercial” ill-defined, people who use Creative Commons believe that most in-dispute use cases count as commercial. Which is why Wired’s declaration that editorial use by bloggers and publishers — for-profit or not, Wired competitor or not — is okay is so interesting. If more publishers start releasing their work under CC and declaring more liberal use cases okay, that conversation around “noncommercial use” could start to evolve toward more publisher-friendly terms. Yeah commercial use is pretty restrictive. For example this page has 3 large adverts so it counts as commercial. There the images couldn’t be used on the equivilent page on another website. Actually, no one has ever defined and Creative Commons doesn’t define what counts as commercial under an NC license. Wikipedia could use NC photos, imo, and likely face no consequences for it. But that’s their policy. Re: “we ask for a link back to the original story where the photo first appeared.” Could you please place that in the Flickr description as well because that’s going to be difficult to figure out. I love CC, but this is one of its biggest underlying problems. Its reason for existence is to give people a way to make clear the terms under which they can share content. But those terms aren’t particularly clear to either the people creating CC content or using it. It’s torn between the twin aims of making sharing simple and making it precise. That lack of precision is one thing that scares away media companies (and their lawyers) from embracing CC. (Lawyers don’t like legal agreements about which someone can say “no one has ever defined” the single most important term, even though that statement’s a bit of an exaggeration.) But making the licenses more specific and complex would likely scare away some users who don’t want to read through a legal treatise to share their Flickr photo. In any event, despite that complication, bravo to Wired for wandering into this space and, perhaps, illustrating a possible business case for openness and sharing. POSTED Nov. 8, 2011, 11:30 a.m.
Benton, Joshua. "Wired releases images via Creative Commons, but reopens a debate on what “noncommercial” means." Nieman Journalism Lab. Nieman Foundation for Journalism at Harvard, 8 Nov. 2011. Web. 23 Apr. 2019. Benton, Joshua. "Wired releases images via Creative Commons, but reopens a debate on what “noncommercial” means." Nieman Journalism Lab. Last modified November 8, 2011. Accessed April 23, 2019. https://www.niemanlab.org/2011/11/wired-releases-images-via-creative-commons-but-reopens-a-debate-on-what-noncommercial-means/.